In an essay on the Fourth Industrial Revolution , Klaus Schwab writes that ongoing technological innovations "will change not only what we do but also who we are," and that the "list is endless because it is bound only by our imagination." His examples range from those that very few comprehend (Artificial Intelligeance and biotechnology) to those which are now ubiquitous (smartphones). Crucially, however, is Professor Schwab's view that "Constant connection may deprive us of one of life's most important assets: the time to pause, reflect and engage in meaningful conversation." It is a refreshing observation - one not generally captured by self-professed technology enthusiasts - and is a topic worth examining as communication becomes increasingly instantaneous. Although technology provides the world with many opportunities, Millennials must navigate a world where fast and superficial supersede consideration and depth. We now live in a world where it is virtually impossible to disconnect. When travelling on trains, for instance, it is often difficult to find individuals simply peering outside a window, observing the places they pass by, rather than scrolling through their news feeds and emails. Whether on the London Underground, on a train passing through the British countryside en route to Edinburgh, or on a three-hour bus ride from one Canadian city to the next - my current setting as I write this - it is more common to find individuals on their phones than not. It is a challenge that all of society faces, though it is certainly acute with Millennials where technology has been intertwined with much of their upbringing. In Sarah Maitland's How to Be Alone , she writes that society now has "a serious social and psychological problem around solitude." When presented with opportunities to do nothing, many of us feel that we must fill in the empty space - responding to texts, looking at a friend's social media profile, browsing through local news and the countless other opportunities at our fingertips. Similarly, we feel compelled to respond to emails within hours, and texts within minutes. This new reality has helped redraw the boundaries of business, for we can now conduct business wherever we happen to be in the world - a conversation with a colleague across the Atlantic is only a Skype call away. But empty spaces are equally ridden with guilt - a knowingness that we are not taking advantage of the information the world has to offer. Our hyperconnected world creates challenges around thinking for ourselves, in spaces of temporary isolation from people around us. One of the most important - and challenging - questions to ask in life is "What do I think about this?" We live in a world where it is easier than ever to piece together arguments based on quick Google searches, and through opinions gleaned on social media. However, to critically examine something on one's own requires time away from others. In a socially connected world, we must dedicate special effort to distancing ourselves from our colleagues, at least temporarily, so that we may develop perspectives that are truly our own. This social autonomy is a challenge when hyperconnection allows us to connect with both friends and internet users who feel they can provide us with worthwhile advice. Second, the demand for instantaneity hinders us from sitting on important decisions. Common advice in the world of entrepreneurship is to iterate through quick decisions and small failures. However, often times it is better to sit on a decision, telling others "I will come back to this shortly," than to provide a response because others expect rapid communication. Doing this in response to messages on Facebook or Twitter can be a challenge, but it allows for genuine consideration before making a decision. Our world of hyperconnection also leads to psychological exhaustion, borne from constant and yet superficial engagement with information. In a world that favours doing, it is commonplace to arrive home from work having done much and yet accomplished very little of substance. This is precisely because work of meaning requires immersion in an activity, often over hours, uninterrupted by others' demands. Superficial engagement, as I find it, leads to an unrewarding tiredness - one of consuming information, which smartphones favour. Knowledge is more difficult to arrive at, precisely because it requires sustained engagement on a topic, with little disruption. Finally, we are now faced with a crisis of privacy; that is, deciding what it is that we should share online, and more importantly, not share online, with others. Online social platforms facilitate open exchange of information; however, some details - such as one's inner thoughts, relationships, successes and failures - are sometimes best kept to oneself. Believing that they must create 'personal brands,' Millennials often showcase their ideas and life experiences without having fully allowed them to settle. This prevents one from making sense of an issue, and leads instead to insecurity in one's self, and a feeling that one must strive to do more. Millennials, when looking at sharing through an online social platform, should ask, "Why am I doing this?" and "What good will I accomplish through this activity?" 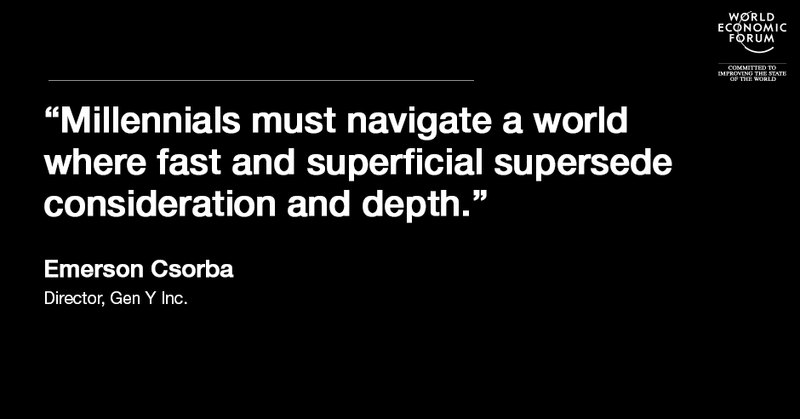 Indeed, our world is changing, as Professor Schwab describes. The instantaneity of communication and interconnectedness of the world places new demands on Millennials in how they live their lives and cultivate a sense of self. Professor Schwab is correct in writing that we risk losing the ability to pause, reflect and engage in meaningful conversation. Building on this, I see the development of social autonomy, patience in making decisions, depth of study and careful examination of what should be kept private, as qualities worth pursuing in a world that "will change not only what we do but also who we are."